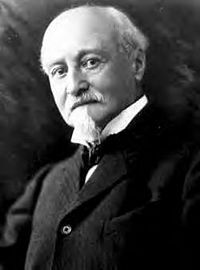 As we sample the cheese, we might send high-flying birthday greetings to Octave Chanute; he was born on this date in 1832. A civil engineer who was a pioneer in wood preservation, primarily as applied in the railroad industry, he is better remembered for his application of these techniques first to box kites, then to the struts in the wings of gliders. Through thousands of letters, he drew geographically-isolated aviation pioneers– including Orville and Wilbur Wright– into an informal international community: he organized sessions of aeronautical papers for the professional engineering societies that he led; attracted fresh talent and new ideas into the field through his lectures; and produced important publications. At his death he was hailed as the father of aviation and the heavier-than-air flying machine.